PAWS AND SHOES, BOOTS AND SNEAKERS. BICYCLE WHEELS AND SLEDS ARE DETECTED ON THE MORRIS PARK ROAD TRAIL THIS MORNING. Five inches of fresh powder in late February. This snow was like the old days in December 2010, a fluffy dusting, a reminder that winter still has its grip on our region. 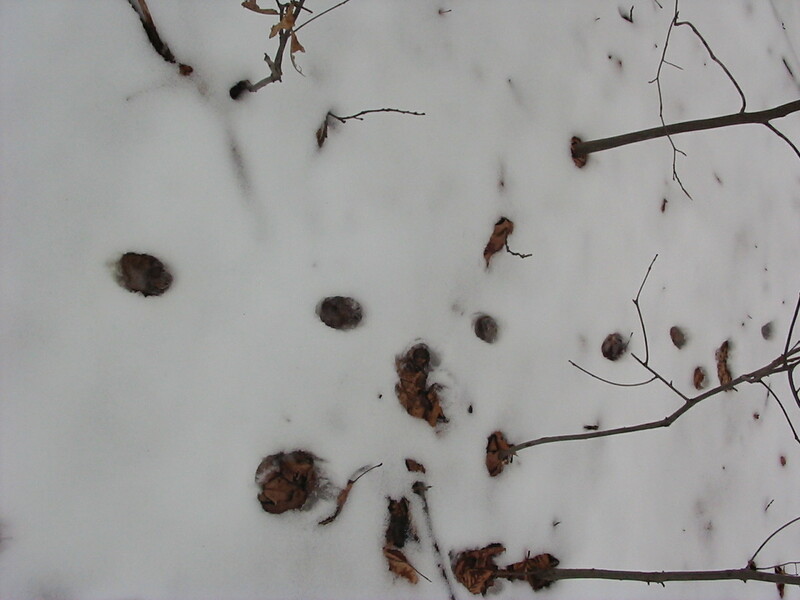 Before the snowcover is gone for the year, coming soon, there is a need for some mention of how great snow is for tracking. Nothing is lost on a fresh coat of snow. 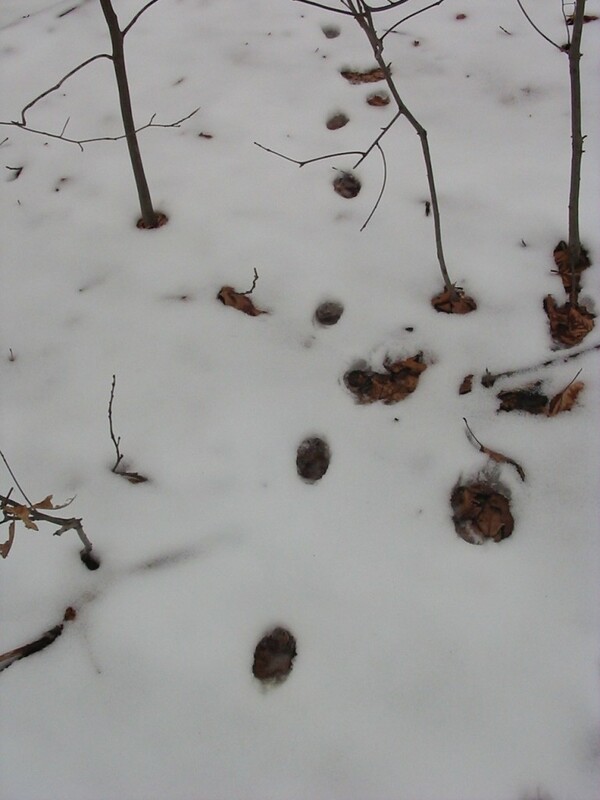 The wanderings of deer and fox, human and dog are recorded exactly as they are on the frozen sheet of snow. If we would like to follow the passage of any of these creatures, this is the time. 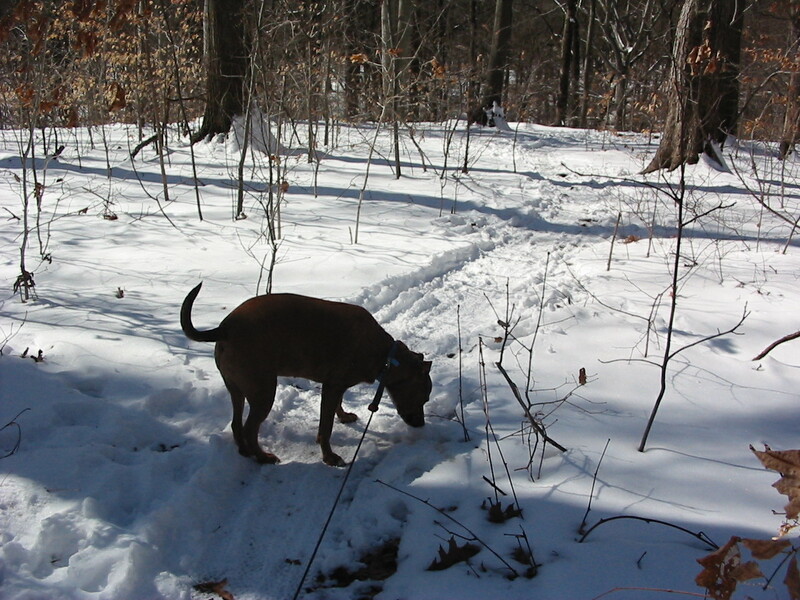 We can live the morning commute of a white-tailed deer, or of an energetic canine by following their footpath. The snowcover will hopefully protect the soon-to-be emerging wildflowers from having their delicate buds being crushed by feet. The log-bordered trail, in some sections, was designed to wind around our populations of delicate and beautiful spring wildflowers, so they can be appreciated, photographed, drawn, inspected, meditated upon, admired and thoroughly enjoyed without being crushed accidently. It is heart-warming to see so many tracks on the trail, that there is an enthusiastic usage in our community of this fantastic and inspiring natural area, right here in the City Of Philadelphia, one of the largest cities in the country. 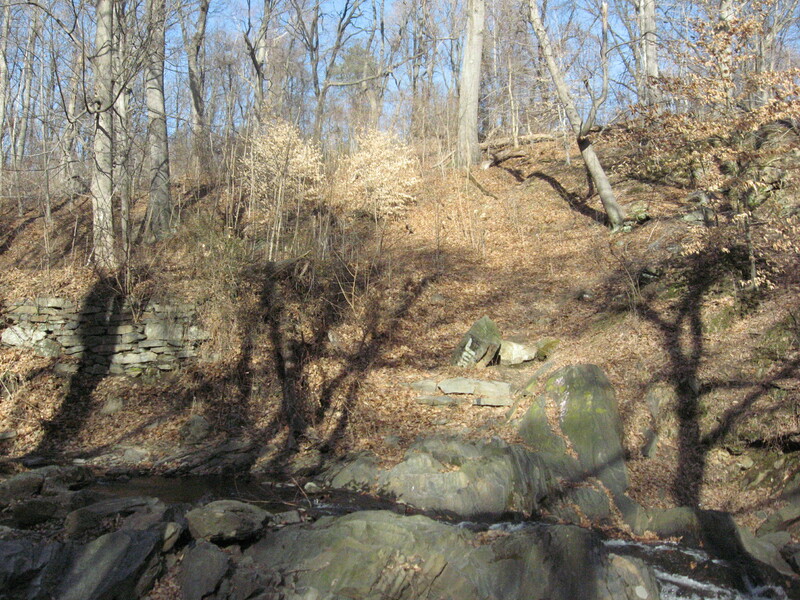 The diversity of native-to-Pennsylvania trees, shrubs and wildflowers in Morris Park is notable. 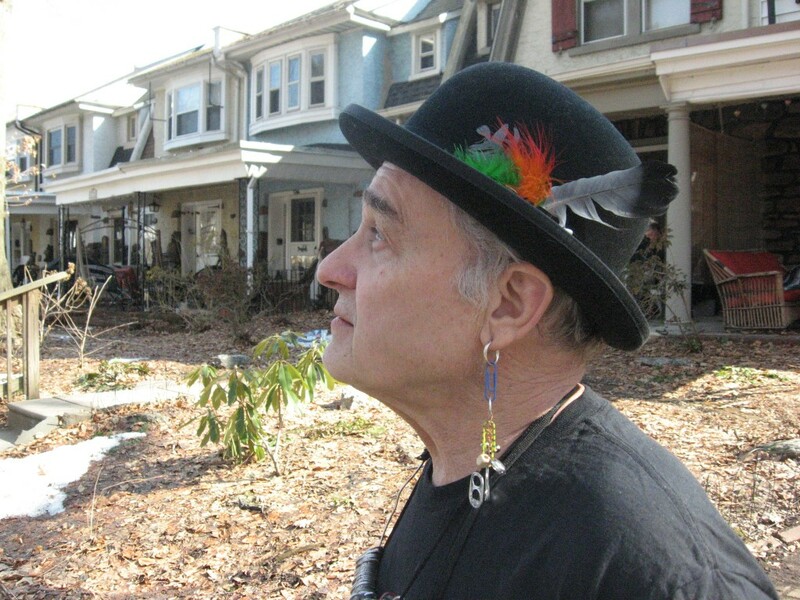 While the City Of Philadelphia has a distinguished and great personality in its people and its amazing architecture (especially our rowhomes, which are spectacular in architectural detail), our parks that represent and contribute to the diversity and richness of the flora and fauna of Pennsylvania are the most astounding quality of our urban status. 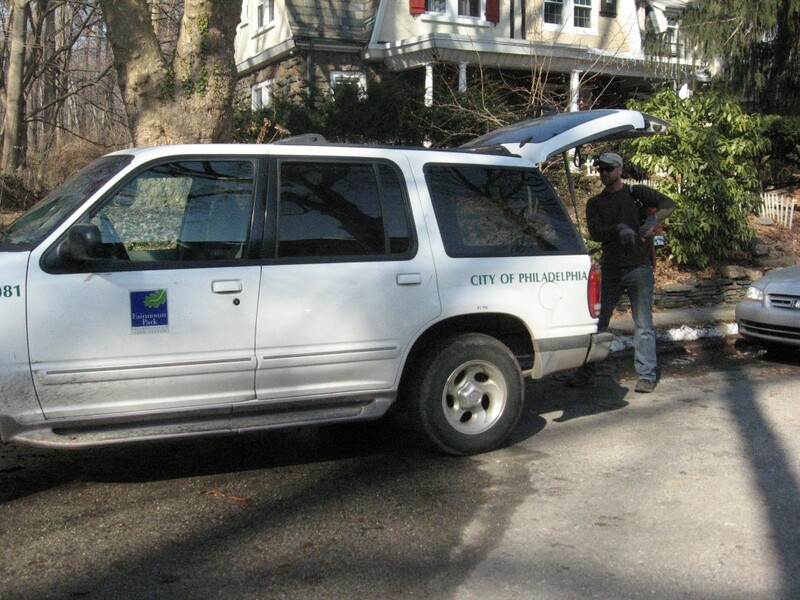 Philadelphia is a city of homes and forested Parks. 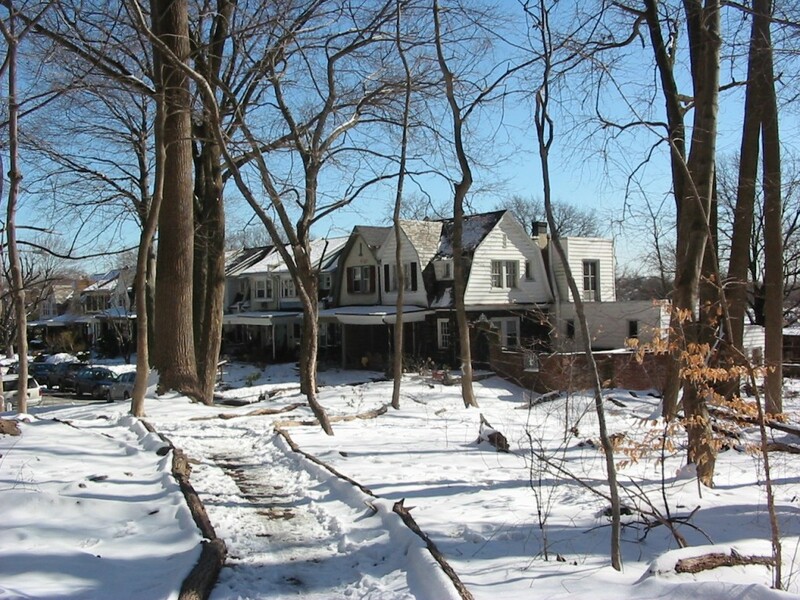 Here, there is a heavily used Morris Park trail, with a neighborhood of fine row-homes in the background. This image robustly illustrates how a densely populated urban area can elegantly co-exist with it’s northeastern deciduous Pennsylvania piedmont forest location. What is most uplifting is the amount of appreciation from the surrounding community there is for this arrangement. The sense of belonging, attachment, usage and responsibility is clearly evident in the tracks in the snowy trail. We also track some of the most unfortunate circumstances we face in the area: heroin users who leave behind empty bags and paraphernalia, sometimes in alarming frequency and with disturbing deposits, sometimes very close to our homes. 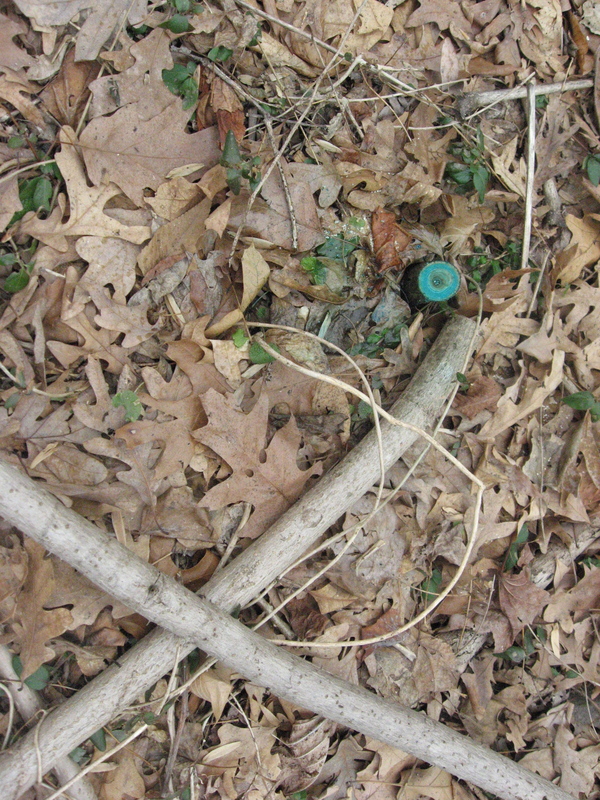 There are those that toss their empty beer cans into the forest along the trails. The Sanguine Root does our best to not let our blood boil. We pick them up, and move on. When we hear of other neighbors doing the same, we feel even better! 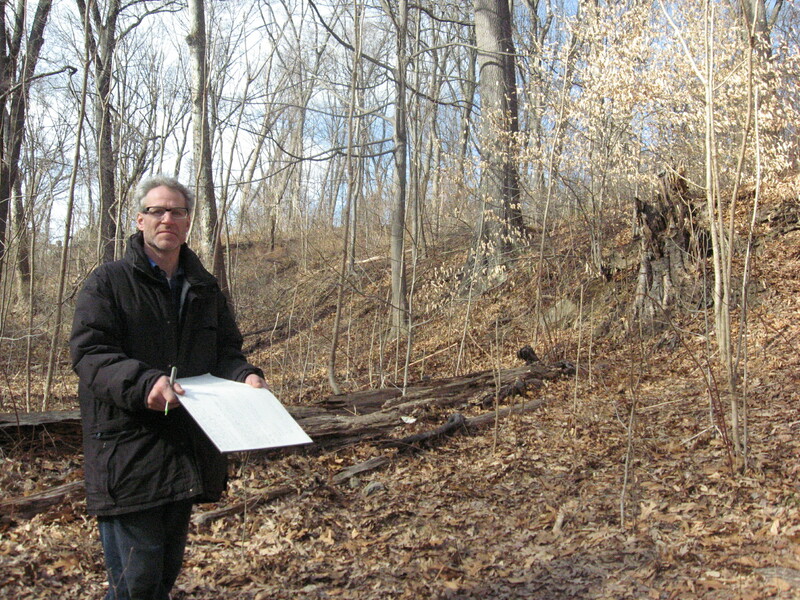 The Morris Park Road trail has become a place where the neighbors see each other and talk. it is an everyday experience. In the most heavily used sections there is hardly a bit of trash found, because someone in the neighborhood has picked it up. 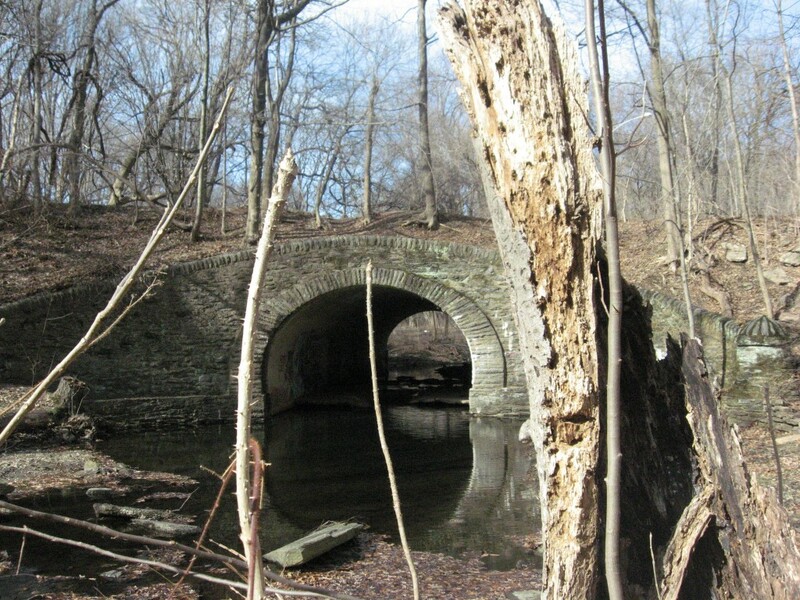 When we go into the park, we want to experience the woods, and luckily enough for us here in Overbrook, the woods is right here. The snow clearly shows how much the park is being used. All the foot traffic we see is inspirational. For anyone who is able to get to an accessible natural area or park, we recommend that you take a walk in your place if you can. “Take a walk in the park” -one of the Sanguine Root’s mantras. By the way, less than 30 days until spring, so enjoy all that winter has to offer! 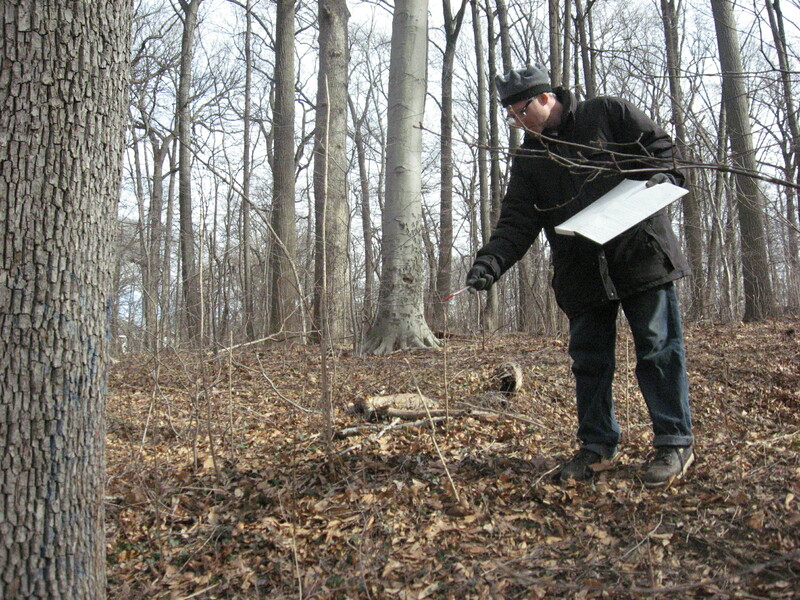 SANGUINE ROOT STAFF TASKED WITH MAPPING SPECIES ARALIA ELATA IN MORRIS PARK. OVER THIRTY DISTINCT POPULATIONS FOUND PARK-WIDE. 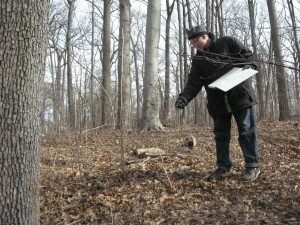 SPECIMEN COUNTS INTO THE THOUSANDS AT SOME SITES. 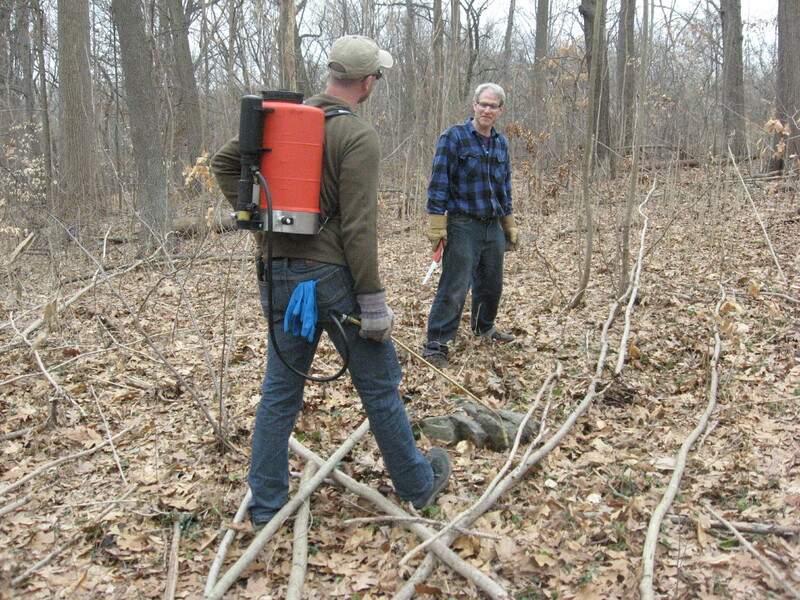 We were charged with the task of mapping out the populations of the invasive exotic Japanese angelica tree, Aralia elata, so that the eradication strategy can be done as efficiently as possible, targeting the populations that threaten crucial areas of the park first. These populations would be the ones threatening the least disturbed areas of the Park. These areas get the highest priority of protection. 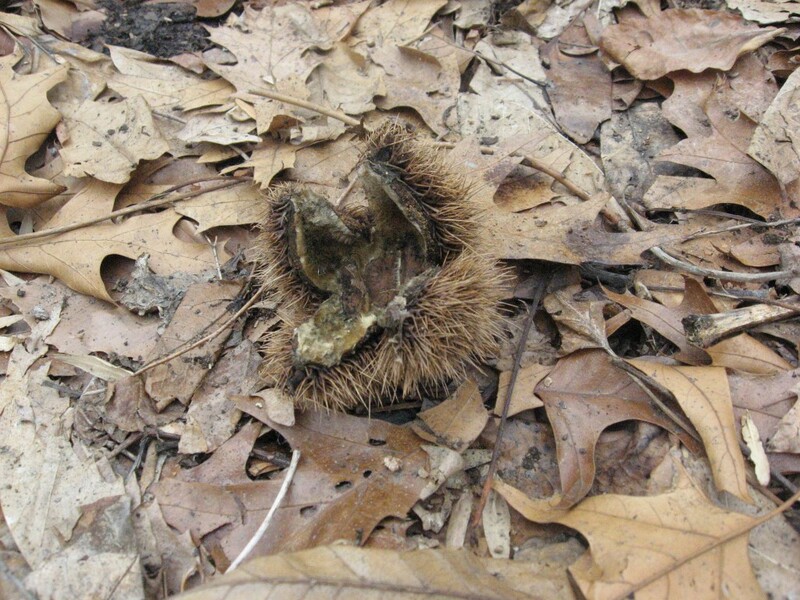 On this past Friday’s Aralia elata eradication work-day, we were awakened to the alarming expansion rate of this species. Isabelle astutely asked “how old are these trees?” We counted the rings of a specimen stump we cut in preparation for the triclopyr herbicide , and we got the answer. The specimen, approximating two inches in diameter at the base was not even 10 years old. The large area we were trying to eradicate was young. We decided to make a day of it and map out all of the populations we could find. We were surprised to find large populations that we had not previously noticed. 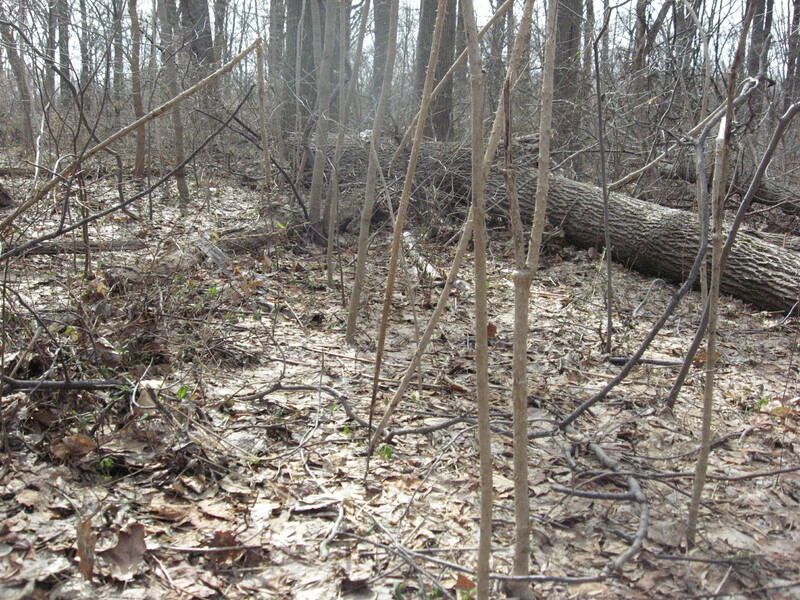 In the picture to the left, we found a small grouping of this invasive exotic growing adjacent to site v-79a, designated a high-quality forest site with a high priority of protection by the Fairmount Park Master Plan. This, in our estimation, should be given priority status in eradication. The mapping exercise was a fun and educational way to spend a sunday afternoon. It was like going for a walk in the woods with a purpose. As we drew our map, our understanding of the park was expanded greatly and we became very aware of the park’s relationship to the species Aralia elata. We noticed that the largest populations tend to grow further from the creek on drier land. 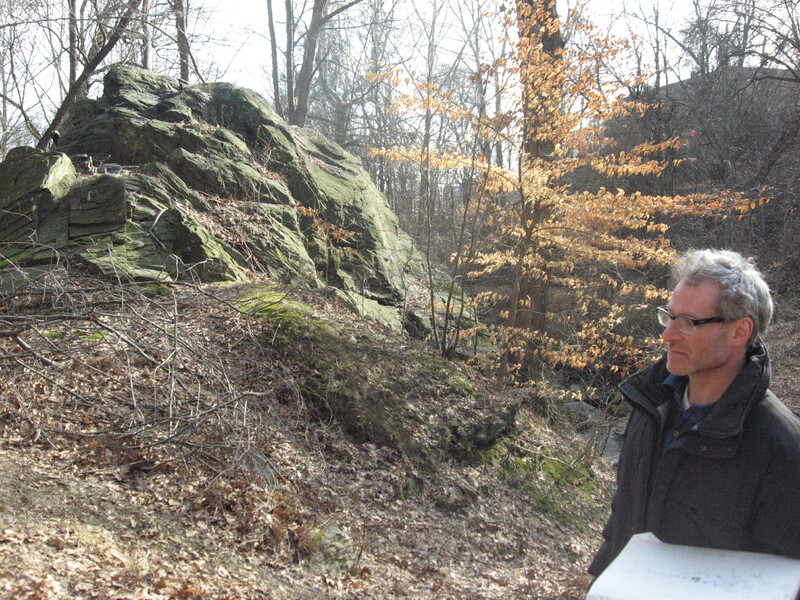 We also noted that when there is one noticeable specimen, there can be many smaller ones to be found. This helped us count the populations as we became familiar with the growth habits of groupings of different sizes. We also became familiarized with the shape, color and habit of the species, to the point where we could spot even a small one from a distance. We trained ourselves over the past few weeks. Even with the 30+ populations we discovered, and the numerous specimens to be eradicated, we are optimistic of the eventual eradication of this species from Morris Park. 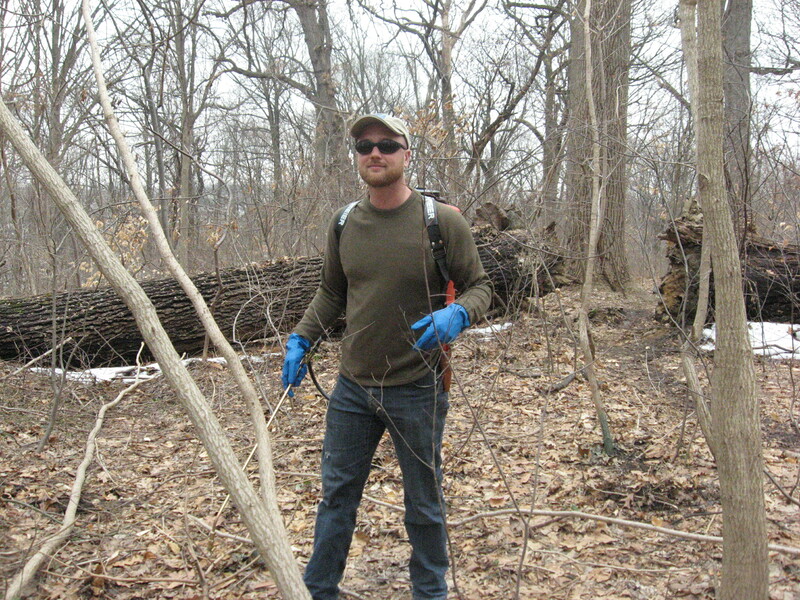 So far, in just one day, we made a serious effort at eradication of 2 populations approximating 500 specimens. 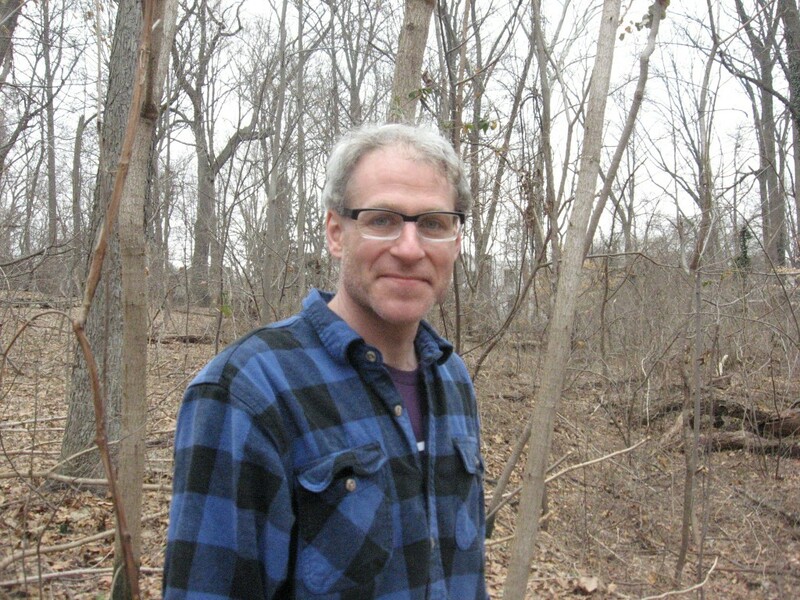 With this in mind, the possibility of a complete map and an eradication blueprint that can be completed with the aid of Fairmount Park and community volunteers, could be attained. 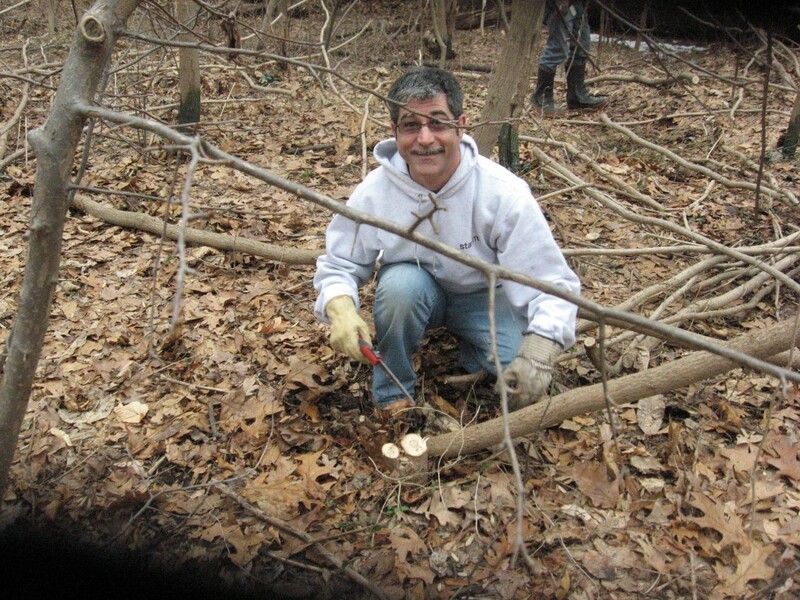 The importance of this accomplishment will not only benefit Morris Park, but any natural areas nearby and the environment as a whole as this problematic species is addressed. The Sanguine Root staff urges that eradication of this emerging invasive species be prioritized. 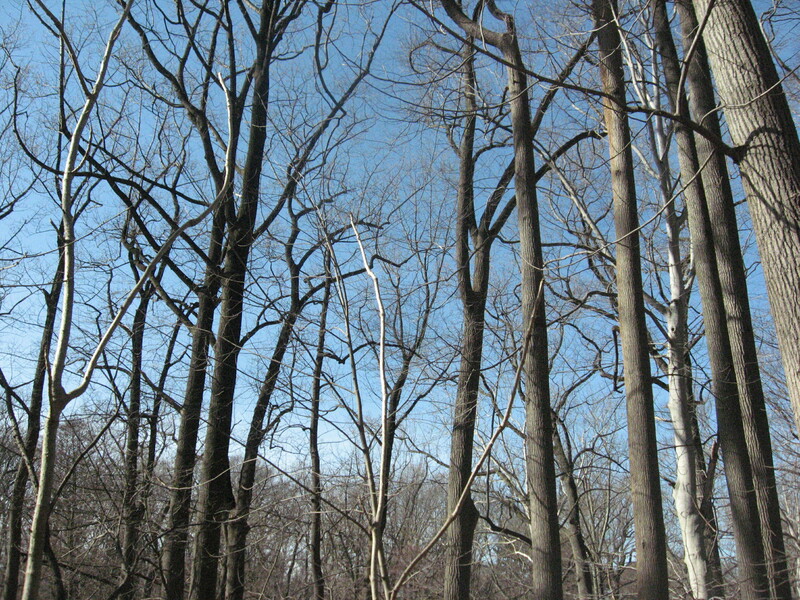 The dense stands of Aralia elata have not yet completely crowded out the native species in their shared areas, and the populations have not yet become widespread in their potential habitats, like so many other invasives in Morris Park. 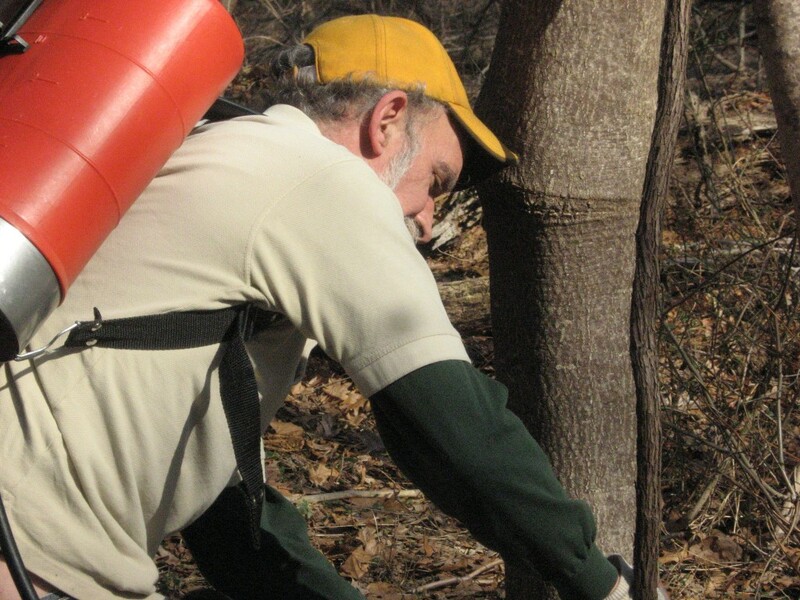 However, judging from the spreading habit and rate of increase, this species presents a threat to Morris Park’s upland areas and well-drained hillsides, where some of the most diverse and high quality forested areas are present. Please be sure to visit our mapping efforts on our website. We will be continuing to improve the map, and update the status and exact locations of individual specimens and populations. We will also be uploading a photograph of each site when it is appropriate. 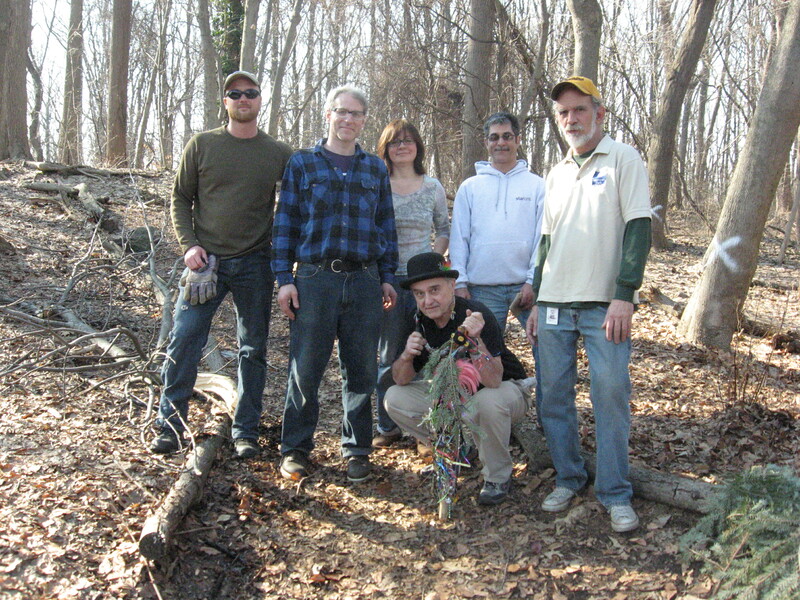 DEDICATED AND TALENTED ENVIRONMENTAL RESTORATION TEAM TACKLES TECHNICALLY CHALLENGING TASK OF REMOVING JAPANESE ANGELICA TREE. 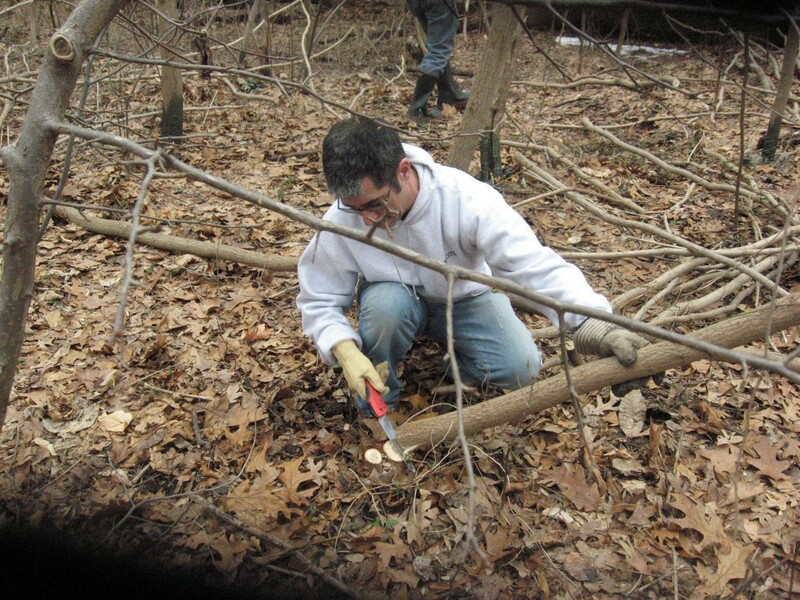 In partnership with Fairmount Park Environment and Stewardship Division (Philadelphia Parks & Recreation), The Sanguine Root staff and community volunteers focused on removing a significant and problematic population of Aralia elata from Morris Park. 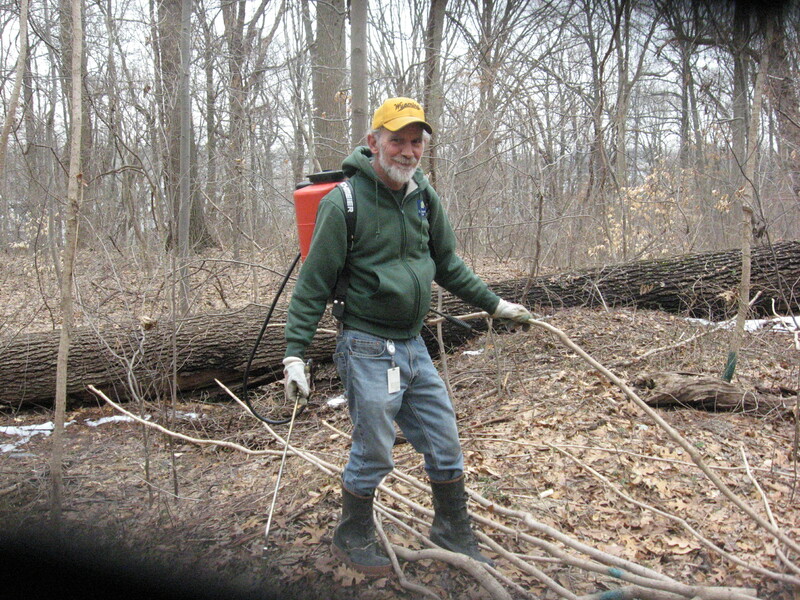 See February 17th’s post for more information on the Aralia elata invasion problem in the park. 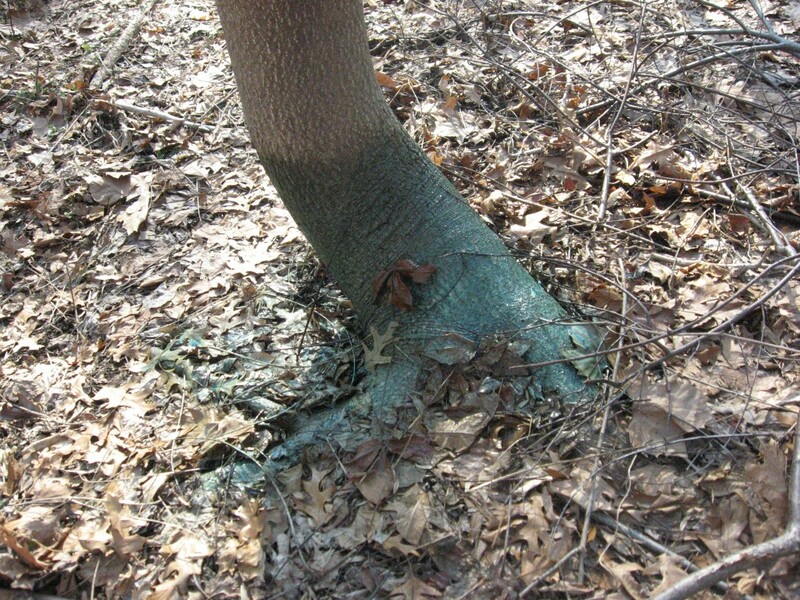 The Herbicide used is Garlon 4 ‘ultra’ dyed blue to prevent redundant applications. Ten Ailanthus trees (Ailanthus altissima) were also addressed. These trees were throwing out thousands of seeds every year creating a huge problem of seedlings that constantly had to be pulled and the threat of a more serious infestation.This is the tree often found growing out the sides of buildings, in sidewalk cracks, vacant lots and back alleys. The amount of property damage it has done is astounding, and it has the potential to destroy the entire built city in a matter of a few years if left alone. In a forest setting it will crowd out native species and create a monoculture of trees. 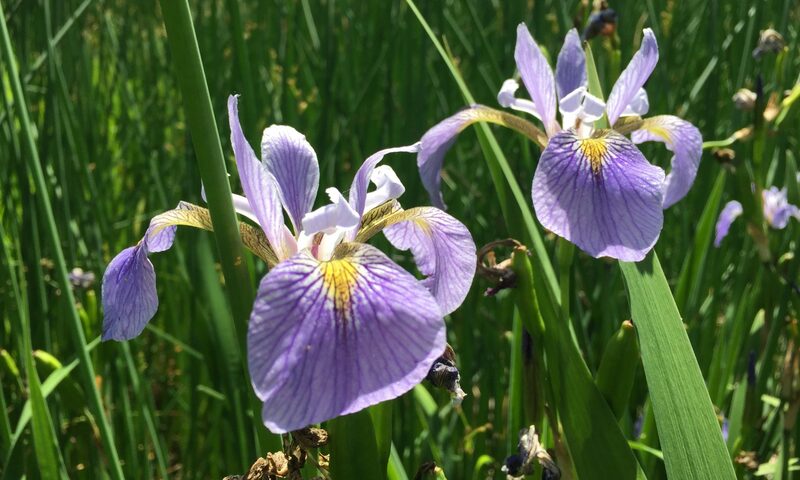 This menacing invasive was introduced as an ornamental in 1784. 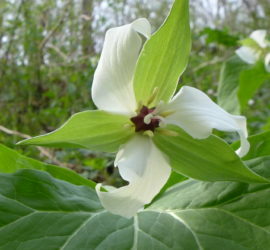 It has a distinguishing foul odor when the plant is disturbed. 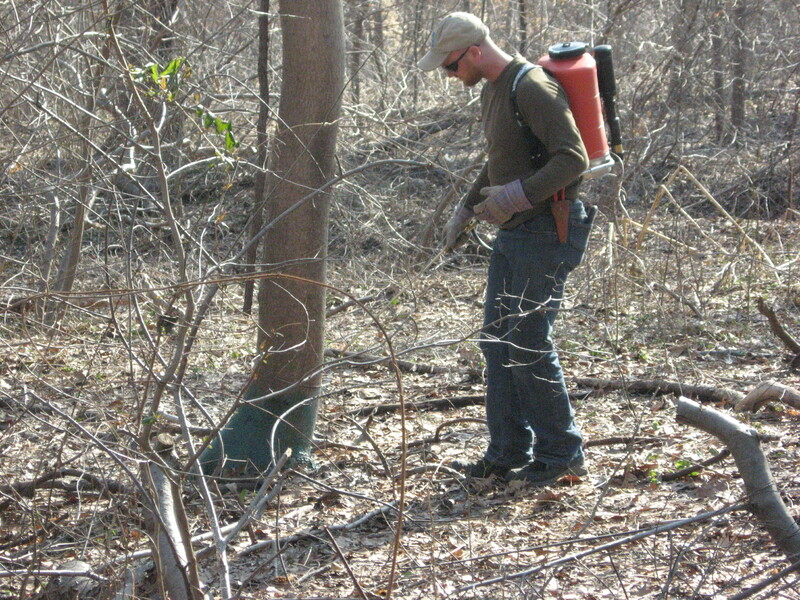 We are very happy that our Department of Parks and Recreation technicians were able to apply basal bark herbicide to the trees.